Well, at least for my girlfriend, hehe. Last Friday I had the brilliant idea of arranging a painting session at home, and I asked my girlfriend to come and try her skills with the brush. So I cleaned part of the kitchen’s table, brought there my lamp, water, paints and that stuff; so we can have a nice environment this first time painting together. After an hour or so trying to teach her about the importance of thinning down paints or the best way to apply paint with the strokes of the brush, we both gave up, she admitting not having patience for this (patience is not one of my hot-tempered honey qualities). Well, at least she tried; and in the end we reached the agreement of she learning a bit how to play the game and visiting and supporting me when I played, and I doing all the painting business. If somebody there thinks that’s not a good deal, I strongly disagree. It’s FAR more than what I had before, so it’s ok for me and I’m happy with it. Oh, and I must say that even with her lack of patience, she wasn’t doing bad at all, as the “end of session” picture shows. Pity she won’t go any further… well, maybe I can take her as an assistant when making scenery; we’ll see. 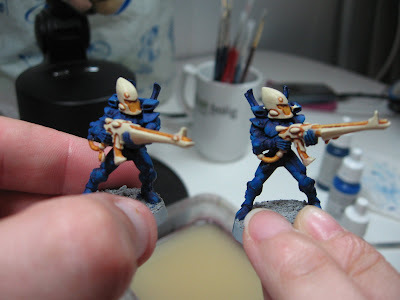 My wife got me started on Eldar for the same reason (everyone else was ugly). At least your girl was content with a Craftworld already in the book. My wife wanted the craftworld colours to be pink and purple! For a while, I obliged, but being the fluff-nutter that I am I eventually convinced her to pick one from the book. Her eye caught on that same mottled blue Viper that you described. ...and now I paint Alaitoc. 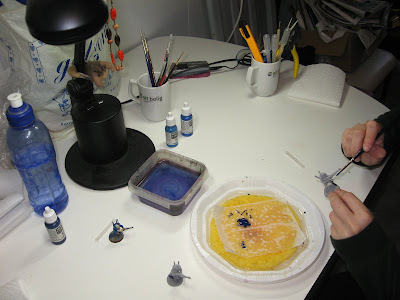 Keep up the good work, I always like finding new blogs that share the hobby.